In Orthodox Churches, Christmas Means Pierogies Many Americans are busy sweeping up tinsel, but Ukrainian, Russian and other Orthodox churches are preparing for Christmas this week. And at the Christmas Eve feast, most of the faithful will eat pierogies. 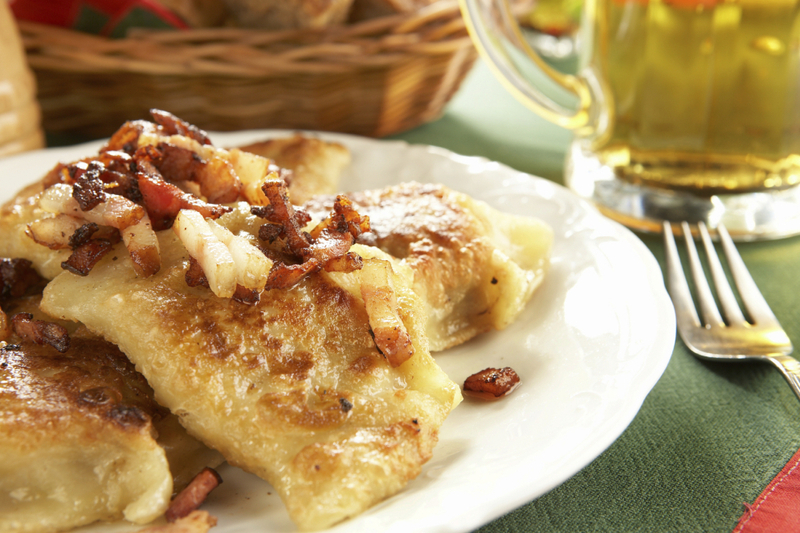 Pierogies are dumplings filled with meat, cheese or vegetables. Many Americans are busy sweeping up tinsel, but Ukrainian, Russian and other Orthodox churches are preparing for Christmas this week. And at the Christmas Eve feast, most of the faithful will eat pierogies. These dumplings are traditionally prepared at home, but recently they've become something of a parish industry. Myra Petrouchtchak sets up shop in the basement of St. John the Baptist Ukrainian Church, a small parish of about 50 people in Southeast Portland. She's sitting with a few dozen others, stuffing and shaping potato pierogies by hand -- more than 2,000 pierogies. They've developed a following in the neighborhood. "People come here and say that those pierogies remind them about their childhood," she says. "Not only Ukrainian people -- some German people, Polish people. And it's like, 'Oh, my grandmother used to do that.'" Petrouchtchak and her husband, the priest at this parish, started weekly pierogi sales when they came to the church five years ago. They've raised enough money to renovate the church basement. But from the beginning, this was more than just a fundraiser. "It was good for the parish as a community," says Petrouchtchak, "because many young women didn't know how to make pierogies or didn't have time to make pierogies at home. But here, all children can learn how to do it and carry on the tradition." And lots of kids are helping. The older ones shape pierogies; the littlest ones carry trays from the kitchen. Andrea Roelofs is third-generation Ukrainian-American, and explains that while the kids learn about their Ukrainian heritage, the adults get something out of it, too. "It's a great way to socialize," says Roelofs. "They come in and they're a little frustrated with something. By the time they leave, they're fine. It's cheaper than a psychologist." Another thing about pierogies: They are delicious, especially topped with sour cream and caramelized onions. But as it turns out, the pierogies that these women make aren't totally traditional. Usually they'd be made with a bit of cottage cheese, but St. John's uses cheddar instead. Parish member Maria Kamsha says the results might be a little too good: "My children will say, 'Mom, you know, your pierogies that you make at home, they are not quite that good as the ones that are at the church.'" Kamsha is wistful about the change. While the exact recipe may have evolved, the heart of the tradition -- friends and family coming together over pierogies -- is not in any danger of dying out.